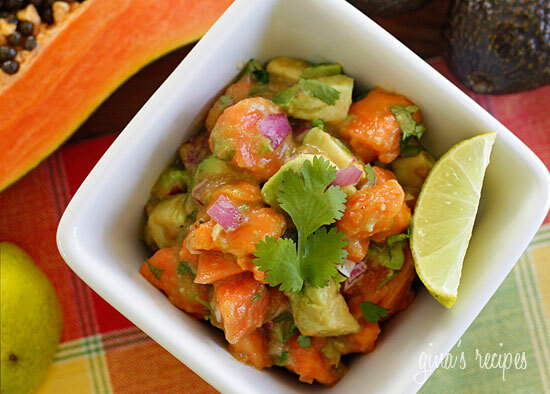 Papaya, avocados, lime juice and cilantro – this luscious tropical salad will make you feel like you are in the sunny Caribbean. 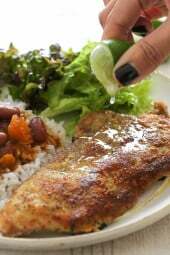 This salad pairs wonderfully with rice and beans, grilled chicken, fish or steak and it’s loaded with vitamin C, A, folate and fiber. You can add a jalapeño to add a little kick! This would even make a great salsa to serve with chips. Perfect for all diets restrictions, vegan, gluten free, low carb, egg free, nut free, to name a few. Enjoy! 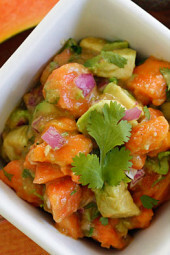 In a medium bowl, combine avocados, papaya, and cilantro. 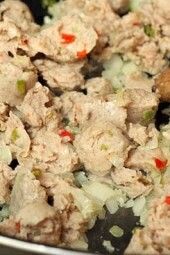 Toss with lime juice and onions and serve immediately. Delicious beyond words. Make sure your papaya is ripe. Avocado is not zero points on freestyle so there should be points for a serving of about 3 sp. Really delicious! Used half papaya, half mango–completely yummy! Served with the Black Bean-Butternut Squash Enchiladas and Cilantro Lime Rice from your stash , too! Really, really, really good. Never thought to combine avocado and papaya and did not know what to expect. Amazing how delicious and simple this salad is. Added to my permanent files now. I made this recipe last night and paired with BBQ grilled chicken. It was sooo good. Thanks for sharing Gina. I added grilled shrimp to this recipe, it was delicious! Thanks for sharing! I used to be the "Can't Cook. Don't Cook. Shouldn't Cook." in the family. ha ha ha ha HA HA HA HA. Now I'm AMAZING! Thank you. Thank you. Thank you. Just Stumbled Upon you today. Love this blog!!! This was an unbelievable combination!! We like to eat vegetarian at least once a week and I paired this with your Cuban Rice and Black Beans, as suggested. What a super satisfying meal! Thanks so much for all your hard work Gina! A melon ball scooper would be perfect!! Magaidh- I love the onion but for those who don't, you can leave them out. Let me know how the jicama works out. Gina, I made this again this week (again! this is the fourth time! ), and I had a brain flash. I've been mellowing those onions as you suggested, but my boyfriend still finds the flavor of them to be too much (he's not much of an onion-eater, in general, though I love them!). So here's my brainwave: next time, I'm going to try it with jicama! Same crunch, less pungent (/lingering) flavor. I'll let you know how it goes! This is very tasty. I've never cut open a papaya before, so it was a bit of an adventure! I used my melon baller and it came out great. This goes well with shrimp quesadillas. Made this for my visiting mom last week. She was so impressed with me 🙂 Truly a delicious salad! I'm having this for lunch while my Santa Fe Chicken cooks in the crockpot. Your blog is my one stop shop for DELICIOUS ww recipes. Thank you! Magaidh, it mellows the onion flavor, you'll love it! Oops! No, I totally missed that part (just copied out the ingredients and had at it!). Now I'll know! Thanks, Gina and Angela! Wow. This is perfect for spring! I'm really starting to crave cold, raw foods again! I'm totally going to try this 🙂 Thanks so much! I'm happy you all liked this, yes I mentioned I soak the onion in lime juice and salt first. 5 to 10 minutes or longer. Not sure if you read that but it mellows the flavor of the onion. Made this recipe tonight. 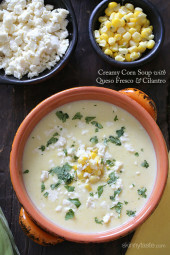 Only thing I changed was I didn't add the Cilantro as my hubby doesn't like it….but honestly, it was good without it. LOVED IT!! I diced my onions very small after reading other comments about the onion etc. but I love onion so it's not a problem for me. But I have to say all the flavors worked well together….Thanks Gina!! This looks super yummy! I am thinking it would be delish with grilled chicken breast in a wrap for work lunches this week, mmm. @Magaidh – I often make a mango/fruit salsa to pair with fish and always add red onions, and I too always found them them really overpowering until I started dicing them and soaking them for 20 minutes or so in cold water. It took away the bite and left a crisp sweet complimentary onion flavour. Try it! So beautiful – like summer in a bowl! You can easily make halve this recipe so you don't over-indulge! I have had something similar to this but instead of papayas, used with mangos and it is tasty! Problem is limiting myself to 2/3 of a cup! Yummy! I added cantaloupe too! As a main dish, I would add some protein like chicken or shrimp on the side. I made this for lunch today and I was a little concerned that I wouldn't be full. But honestly, the richness of the avocados was just enough to make a super fulfilling lunch! I may just bring this tomorrow as well! these are my kind of recipes!! Clean, simple, healthy!! I love it!! Mangoes are wonderful with avocado!! You can use mango instead or use both! Mango with avocados are great too. Add shrimp and you have a meal! This sounds great…I was thinking of mango (we have many here in California)…what do you think? You are amazing! I love all of your recipes and as a fellow WW member, it helps so much to know the PointsPlus values – Life is easier when someone else calculates!! Thanks so much. Gee, this is the perfect salad! Has everything I love! wow! my mouth is seriously watering! papaya too? really??? wow!!!!!!! Gina – Your Macaroni and Cheese is dangerous to have in the house…it was so good. Tomorrow will be the third day in a row that I'm finding stuff to eat with it – anything! Avocados and papayas pair really well and they are so good for you. I made papaya muffins with the leftover papaya, amazing! I will post this week! Oh man…I love this idea. Avocado and papaya go so well together! Anything with avocado is always a winner in my book. I cannot remember the last time I had papaya but I imagine with the creamy richness of the avocado that it is so good in this recipe. I was looking for a side dish for some chicken tonight. This sounds delicious! Thanks for the recipe. I featured one of your recipes!